Sheet metal screws with (a) sharp-pointed ends; (b) fewer threads per inch than type AB screws: and (c) deeper threads with better gripping power than type AB. The Industrial Fasteners Institute incorrectly labels type A an “obsolete” thread though it is universally preferred in 18-8 stainless over type AB, especially by the marine industry. Sheet metal screws with pointed ends similar to type-A screws and thread dimensions similar to type-B. Type AB screws are seldom used in stainless. ANSI/ASME NOMENCLATURE (B1.1 AND ALL) – The “B” numbers are standards set by ASME regarding various aspects of fasteners. The most common number, B1.1, deals with dimensions and thread tolerances; B1.2 with gages and their use; B1.3 with various systems for gaging threads; B1.7 with definitions of terms. ASTM 193 are chemical and physical specifications for hex head cap screws, studs, and bolts made of steel and stainless steel. ASTM 194 refers to nuts. The commonly used stainless is called grade 8, referring to 304 material to certain specifications, and grade 8M referring to 316 material. The major differences between ASTM and commercial stainless fasteners are: (a) 304 material must be used for manufacturing grade 8, not simply 18-8; (b) ASTM 193-194 generally refers to heavy hex heads and heavy nuts, though semi-finished hex heads and finished nuts may be sup¬plied with the permission of the buyer; (c) cold formed material will require carbide solution treatment or annealing to reduce hardness to meet ASTM requirements. Fasteners made with a particularly high level of attention in manufacture and inspection. A mixture (or alloy) of ordinary steel added to other metals besides carbon with the specific purpose of attaining certain characteristics such as higher strength. A few exceptions to this definition exist, however, so that a chromium content above 4% is not considered alloy steel and above 12% is considered stainless steel. The most abundant metal in the earth, aluminum is blueish and silvery-white, very light, malleable, and ductile with high heat and electrical conductivity. It is non-magnetic and one-third the weight of steel with good corrosion resistance against certain chemicals and acids but weak resistance against other elements such as sea water. To heat metal in order to lower its hardness. The term anneal refers to the heat treatment given all 300 series stainless and most 400 series stainless by a steel mill after the raw material has been completed but before fasteners are manufactured. Anneal also refers to the heat treatment given 400 series stainless fasteners after their manufacture (also called hardening and tempering) to lower hardness and increase toughness, For example, fasteners of 410 stainless may score over 200,000 psi after manufacture and be too brittle. By annealing at 1000 degrees F. tensile strength would decrease to 125,000-150,000 psi; annealing the same material to 500 degrees F. would bring tensile to 160,000-190,000 psi. Refers to 300 series stainless, the most popular of the stainless alloys accounting for 85%-90% of stainless fasteners sold. Named for Sir Robert Williams Austen, an English metallurgist, austenitic stainless is a crystal structure formed by heating steel, chromium, and nickel to a high temperature where it forms the characteristics of 300 series stainless steel. An “AUSTENITE” is a molecular structure where 8 atoms of iron surround one atom of carbon, thus limiting the corrosive effects of the carbon. Austenitic fasteners have the highest level of corrosion resistance in the stainless family, cannot be hardened by heat treatment, and are almost always non¬magnetic. Sometimes heat and friction in cold-forming can cause austenitic stainless to take on slight magnetism. but the corrosion-resistant properties remain the same. The most popular of austenitic grades is known generically as “18-8 stainless” and includes grades 302, 302HQ, 303, 304, 305, and XM-7. Typical industries using 18-8 fasteners include: food, dairy, wine, chemical, pulp and paper, pharmaceutical, boating, swimming pool, pollution control, electronic, medical and hospital equipment, computer, textile.Type 316 stainless has added nickel and especially molybdenum. The molybdenum (called cooly) sharply increases corrosion resistance to chlorides and sulfates, including sulfurous acids in the pulp industry. It has superior tensile strength at high temperatures compared to 18-8. Besides pulp and paper, typical industries using 316 are: photographic and other chemicals, ink, textile, bleach, rubber. Exotic metals in the 300 series include 309, 310, 317, 321 and 347. With superior corrosion resistance at elevated temperatures, these metals are used for furnace parts, high temperature containers and processing equipment, aircraft parts such as collector rings, exhaust systems, and equipment for very corrosive compounds of sulfuric, nitric, citric, and lactic acids. Their usage compared to 18-8 and 316 is very low. Referring to sheet metal screws, type-B indicates a blunt point with more threads per inch and smaller thread depth than type-A screws. The part of a fastener such as the washer face of a nut or under the head of a machine screw that actually comes in contact with the part it fastens. A small slant, usually describing a flat washer which is square and thicker on one side than the other. The slant of the beveled washer can offset a slanted surface, so that a bolt going into the beveled washer may be parallel to the floor or ground. Old term for pan head, “binder” has now come to mean “binding” head screws rather than pan. A fastener where one or two stages of manufacturing have been performed, but the fastener has not been finished. Though some manuals spend pages trying to differentiate between a bolt and a screw, any difference is dubious at best and Star uses the terms interchangeably. For hex head, a bolt does not have a washer face under the head while a cap screw does. The most common alloy of copper, brass is about two-thirds copper, one-third zinc. It is non-magnetic with good strength and toughness, high electrical conductivity, and an attractive lustrous finish. It has good corrosion resistance but not in salt water. Brass is commonly used by the electrical and communications industries, builders hardware, and some marine applications. Using sharp edges to cut material and push it away, broach usually refers to the socket drive on socket screws. Where the shoulder of a screw is perceptibly smaller in diameter than the threaded portion (technically the minor diameter or less). Carbon that breaks loose from its bond within the stainless solution when material is heated between 800-1400 degrees. Under severe corrosive conditions, it can result in extra oxidation and surface corrosion. See Solution Annealed. Ordinary steel with no significant additions besides carbon. A certification that a fastener meets the description or standard to which it was sold. A slight rounding on the end of a fastener or the edges of a hex nut for ease of assembly or smoother appearance. Old term for fillister head in United States; similar to fillister in metric sizes. A blue-white metal, chromium is the most important element providing corrosion resistance in stainless steel. By adding 12% chromium to ordinary steel, stainless steel is formed. Chromium offsets the corrosive effects of carbon found in steel and is the primary factor in the ability of stainless to form a passive film on its surface providing corrosion resistance. Solution annealed in finished condition to meet ASTM A193 specification. Proponents of coarse threads claim: (a) coarse threads exhibit a better fatigue resistance; (b) coarse threads are more tolerant to handling and shipping; (c) coarse threads assemble and disassemble quicker and easier; (d) coarse threads tap better into brittle materials. Means that fasteners are usually solution annealed. Means strain hardened to meet certain minimum tensile requirements. A reddish metal that is an excellent conductor of heat and electricity. It is malleable, ductile, and non-magnetic with low to average strength and good corrosion resistance. Brass and silicon bronze, composed mainly of copper, gain their strength from the addition of other metals, such as silicon. Forming threads on a fastener by cutting away and actually removing the unneeded metal. To remove chips, burrs, or other imperfections through a secondary operation such as grinding. A variety of small or large disfigurations in a fastener such as pits (slight depressions on the surface), tool marks, voids (small cracks), laps, folds and seams (slightly bunched or folded material at corners of a fastener), and inclusions (a slight non-metallic impurity in the metal). Minor discontinuities are permissible in both commercial fasteners and those made to various MS and other specs. The ability of a fastener to deform before breaking (for ex¬ample, an elastic would be more ductile than a diamond). Ductility is a measurement similar to elongation. Stretching a fastener to the point that it breaks. The percent of elongation at rupture (same as measure of ductility) is determined by dividing the total length after stretching to the original length. Elongation decreases as strength and hardness increase. Metals carry electric currents with varying capacities. As a relative guide to the conductivity of different metals, with electrolytic copper rated at 101 under the International Annealed Copper Standard, at 68 degrees F.,18-8 stainless rates is rated at 5; silicon bronze 651 at 12; and brass at 27. A chemical process that cleans and brightens aluminum after heat treatment. When cold forming produces a fastener before threading with two different diameters.The portion with the larger diameter is the shoulder; the smaller portion will be roll threaded. In the extruding process, a manufacturer starts with raw material equal to the shoulder diameter and pushes part of it through a die, reducing the diameter of the portion which will later be roll threaded. F593 is a specification for stainless hex head cap screws; F594 is for stainless nuts. Compared to regular stainless fasteners, F593 and F594 call for: (a) tensile requirements about 20% higher than that of commercial 18-8 or stainless hex caps and nuts to MS specifications (MS35307-8. MS34649-50); (b) both a minimum and a maximum tensile and hardness requirements while commercial and MS fasteners do not have a maximum; (c) chemical requirements that are somewhat bizarre, eliminating many commonly used mixtures of 300 or 18-8 stainless while allowing others. The copper requirements of F593-4 permitting 3%-4% for some grades and no copper for others are senseless. Metal failure due to stresses that push first in one direction and then another. Fatigue Corrosion is caused by repeated stress in a corrosive atmosphere and is generally not associated with stainless. Comprising less than 5% of stainless fasteners, mainly type 430, it is magnetic and not hardenable by heat treatment.Though containing no nickel, ferritic stainless has a high chromium content providing greater corrosion resistance than martensitic stainless but much less than austenitic. It is mainly used by the automotive and building industries for decorative trim, architectural hardware, handrails, moldings on various products. Proponents of fine threads claim: (a) fine threads are stronger in tension because of their larger tensile stress area; (b) because of their larger minor diameters. fine threads develop higher torque and shear strengths; (c) fine threads tap better into thin walls and more easily into hard materials; (d) fine threads require less torque to develop equivalent preloads, since they offer more resistance to vibration. Normally referring to threads, fit is a measure of the tightness of mating parts. Occurs when vibration causes a stainless fastener to continually rub against another surface, resulting in the passive oxide film on stainless rubbing off. Fretting corrosion might occur in high tensile fasteners such as martensitic stainless. When the shoulder of a fastener equals the outside or major diameter of the threaded portion. When two metals or fasteners stick together and cannot be easily loosened. In tightening fasteners, for example, pressure builds on threads as metals rub against each other, and the passive film preventing corrosion on stainless may not form due to lack of oxygen. Heat contributes to galling caused by high speed fastener installation. A reduced wrench speed can help. Thread lubrication is the most effective treatment for galling. An accelerated degree of corrosion occurring when two different metals are in contact with moisture, particularly sea water. All metals have what is termed a specific electric potential, so that low level electric current flows from one metal to another. A metal with a higher position in the galvanic series will corrode sacrificially rather than one with a lower position, meaning stainless, for example, will corrode before gold.The further apart the metals on the chart, the more electric current will flow and the more corrosion will occur. No serious galvanic action will occur by combining the same metals, only dissimilar ones.To prevent galvanic corrosion, use insulation, paint or coatings when separating dissimilar metals; or put the metal to be protected next to a metal which is not important in the assembly, so it can corrode sacrificially. A threaded cone point usually having a point angle of 45-50 degrees. The unthreaded part of a fastener. A chamfer at the end of a fastener formed at the time of heading but before threading. Heating often combined with cooling at controlled temperatures in order to strengthen and harden a fastener. Heating metal to red-hot temperatures or temperatures above the recrystallization point to soften it before shaping a fastener. Hot forging is primarily used when the diameter of the metal is too large for cold forming or the quantity required is too small to economically set up a cold-forming machine. Hydrogen trapped under the surface of a fastener can later cause ruptures. It is generally associated with carbon and alloy steels, not stainless. There may be no external signs of corrosion before a break occurs. Random samples of fasteners taken at differ¬ent process points in the manufacture for testing comformance. A technical term describing corrosion at grain boundaries (various outside portions) of a fastener. It can occur when fasteners are heated above 800 degrees during use, such as welding, which changes the chromium-carbon bond in stainless, thus allowing in¬creased oxidation and corrosion. To prevent intergranular corrosion, low carbon stainless should be used, or material should be annealed and quenched after exposure to elevated temperatures, so the carbon is put back into an austenitic stainless bond. A thinner nut that is “jammed” against another nut to prevent loosening. A heavy malleable ductile metal that increases machineability. Opposite of commonly used fasteners. With left hand thread, a nut would be tightened on a bolt by turning it counterclockwise. A particular size of fastener processed from the same raw material heat and same production process. Random samples taken from the same lot of fasteners for quality inspection. Maximum lot size for inspection purposes should not exceed 250,000 pieces; thus, lots over 250,000 would require additional samples. MS – Stands for Military Standards. The overriding characteristic of MS fasteners compared to commercial products is the extensive inspection and lot traceability for MS, guaranteeing the chemical, physical and dimensional qualities. 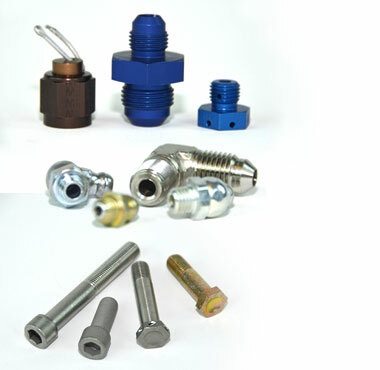 While commercial fasteners may look similar and happen to pass many tests given MS products, the commercial fasteners lack the pedigree of guaranteed quality for chemical, physical and dimensional aspects that users who order MS fasteners rely on. Same as free machining. Refers to the malleable characteristics of metal when cutting or forming on screw machines. As related to stainless fasteners. 300 series stainless is non-magnetic in its raw material condition. Cold working can sometimes induce traces of magnetism in 300 series, depending on the severity of cold working and chemical composition of the stainless. A rise in magnetism is related to an increase in tensile strength and work hardening caused by the heat and friction of cold forming and does not reduce corrosion resistance or cause any molecular change in austentic raw material. A higher portion of nickel can increase stability in stainless, thus decreasing work hardening and any possibilities of magnetism. Brass and silicon bronze are non-magnetic. Many stainless specs including MS hex head cap screws allow 2.0 magnetic permeability which translates to low/medium magnetism. Magnetic permeability of 1.0 translates to a very slight, glancing magnetism. Test simply determines the level of magnetism. MAJOR DIAMETER – Largest or outside diameter of the screw threads. A non-magnetic metal which improves strength and hardness. Comprising approximately 5% of stainless fasteners, martensitic refers mainly to stainless types 410, 416, and 420. Named for Robert Martens, a German metallurgist, martensitic grades have a high carbon content which reduces corrosion resistance but allows a sharp increase in tensile strength after heat treatment. Because of its high tensile strength, martensitic stainless is used for highly stressed parts such as control rod mechanisms, valves, shafts and pump parts. Martensitic stainless is magnetic, contains no nickel, loses toughness in very cold temperatures, and may have a tendency to become brittle. Its corrosion resistance is not as good as austentic or ferritic stainless, so martensitic fasteners are used in mild atmospheres. Made on a screw ma¬chine or lathe by cutting material away from the original piece of metal. It is used for manufacturing very large diameters which cannot be cold formed and for small quantities where it would not be economical to set up cold forming equipment. However, machining can interrupt the grain of metal causing a lessening in tensile and fatigue strength. The inside or smallest diameter of the screw threads. Nicknamed moly, molybdenum is a metal added to 316 stainless steel, sharply increasing its corrosion resistance to chlorides and sulfates, especially various sulfurous acids in the pulp industry. Molybdenum helps reduce hardness and increase tensile strength at higher temperatures. Molybdenum is also added to Marutex® self-drilling screws made of 410 stainless to significantly increase corrosion resistance. A metal added to 300 series stainless to provide corrosion resistance, increased strength in both high and low temperatures. and increased toughness in low temperatures. Nickel lowers the effects of work hardening, thus reducing traces of magnetism caused by cold forming and making material flow more freely in manufacturing. The addition of nickel to stainless prevents stainless from becoming brittle at sub-zero temperatures and in¬creases its high temperature properties. Metals without iron. Brass and silicon bronze are nonferrous; stainless is often characterized as non-ferrous, but that is not correct. Old term for truss head. A very confusing term, since the common usage has taken on a different meaning than the technical definition. In Star’s experience, users (including engineers) of commercial fasteners seldom mean the old technical terminology. Technically, passivating is not cleaning but is a process of dipping fasteners into a nitric acid solution to rapidly form a chromium oxide on the surface of the material, creating a passive film that protects stainless from further oxidation (see Passive Film). The purpose of passivating is to remove both grease left from manufacturing and traces of steel particles which may have rubbed off manufacturing tools onto the fastener. In common commercial parlance (meaning non-military and aerospace), passivating means cleaning to users, and the terms “passivating” and “cleaning” are used interchangeably. A wide range of cleaning methods using different mixtures containing nitric, phosphoric and other acids or simply exposing cleaned stainless fasteners to air for a period of time will result in a “passivated” condition. For fasteners that have been properly cleaned, it is impossible to determine the method of cleaning or passivation that was used. AN/MS/NAS fasteners sold by Star have been cleaned, descaled, and passivated to the applicable engineering specifications. The major characteristic of stainless is its ability to form a thin layer of protection called a “passive film” on its outside surface. This film results from a continual process of low-level oxidation, so oxygen from the atmosphere is needed for the passive film to exist. Once formed, it prevents further oxidation or corrosion from occurring. Even if chipped or scratched, a new passive film on stainless will form. A non-metallic substance that lowers the rate of oxidation, thereby helping resist corrosion. Similar to a “B” point, a pilot point is a small (perhaps 1 /8″-1/ 4″) unthreaded blunt portion at the end of a sheet metal or drive screw. The distance between two adjacent threads measured at the outside diameter of the threads. Approximately in-between the major and minor diameters. Type 630 stainless, little used, expensive and not sold as commercial products, it combines corrosion resistance of 300 series stainless with high tensile strength of 400 series. A test load that a fastener must undergo without showing significant deformation. It is usually 90% of yield strength. A measurement like elongation which is related to the tensile strength of a fastener. While elongation measures the length of a fastener stretched to its breaking point compared to its original length, reduction of area measures the diameter of a fastener just before breaking compared to its original diameter. Forming threads on a fastener by pushing or rolling dies against the fastener without any removal of metal. Roll threading. as opposed to cut threading. hardens the material making the threads stronger. Refers to the minor diameter on screws or the major diameter on nuts. A discoloring or oxidation on the surface of hot forged fasteners. Cutting and removing material in order to form a fastener. The normally sold variety of stainless hex head cap screws, semi finished have the same dimensions as a finished fastener but with generally greater tolerances. Measured by the push or pull against the side of a fastener until the fastener breaks (for example, moving an object continually against the side of a screw that is protruding from a wall). As a rule of thumb, shear strength is two-thirds of tensile strength. Double Shear Strength is applying a load against a fastener in two places causing the fastener to break into three pieces. A non-metallic substance that adds strength and toughness to copper to help form a bronze alloy. An alloy made of 95%-98% copper plus a small amount of silicon added for strength. Small amounts of manganese and aluminum may also be added for strength, and lead may be added for machineability.Silicon bronze is non-magnetic with a high degree of thermal conductivity and high corrosion resistance against sea water, gases, and sewage. It is often used by the utilities industry for pole line hardware and switchgear equipment. mine sweeping, sewage disposal equipment, food machinery, marine applications, plumbing and liquid handling. Surprisingly, silicon bronze is only a low to moderate conductor of electricity, though it is a better conductor than stainless. A process of heating and removing carbide precipitants (carbon that has broken loose from its stainless steel solution) by heating raw material or a finished fastener to over 1,850 degrees and cooling it quickly, usually in water, so carbon content goes back into the stainless solution. With the addition of 12% chromium to iron, stainless steel is formed. The chromium protects the iron against most corrosion or red-colored rust; thus the term “stainless” steel. The ability of stainless to form a thin layer of protection on its outside surface, called a “passive film”, is its most important characteristic in preventing corrosion (see Passive Film). The overriding purpose of stainless steel is to provide corrosion resistance against: (a) atmospheric conditions such as carbon dioxide, moisture, electrical fields, sulfur, salt, and chloride compounds; (b) natural and artificially produced chemicals (c) extremes of weather where cold temperatures cause brittleness and hot temperatures reduce strength and increase corrosion. For more information, see Austenitic, Martensitic, Ferritic, and Precipitation Hardening. When iron or ordinary steel are exposed to air, the oxygen in the air combines with iron to form iron oxide known as rust. When stainless steel is exposed to air or oxygen, a thin layer of film, chromium oxide. forms on the surface. If this film is broken, it will quickly reform if enough oxygen is present. Punching out parts with dies, usually referring to flat washers. STOVE HEAD – Old term for truss head. To increase hardness and strength by (a) cold working of raw material by a steel mill or (b) cold forming by a fastener manufacturer, The standards for strain hardened material vary with different specifications. Cold forming by a fastener manufacturer can sharply in¬crease tensile strength and hardness, so that ordinary material from a steel mill may often be used. However, fasteners that are milled from bar will decrease in strength and hardness, so that raw material would need to be strain hardened by a steel mill before milling the fasteners. Occurs when corrosion causes a highly stressed part (one that is pushed to its maximum tensile strength) to crack. Except for heat treated 400 series stainless, stress corrosion does not normally apply to austenitic stainless, brass, or bronze, since these metals are relatively ductile and not normally used for high tensile operations. A non-metallic substance found in large quantities by itself or combined with other elements to form sulfates and sulfides. It improves machineability and helps cool material and prevent galling, but its presence lowers the corrosion resistance of stainless. A gray ductile metal with a high melting point and excellent corrosion resistance against certain chemicals. To put internal threads in a hole or in a nut. TAP BOLT – Fully threaded bolt. A common measure to compare the strength of a fastener. It is the load needed to pull the fastener apart. Class 1 threads are a loose tolerance. Class 2 threads comprise 90% of stainless fasteners and are normal commercial tolerance. Class 3 threads have a stricter tolerance and tighter fit such as socket cap and set screws. No definite relationship exists between tensile strength and tightness or looseness of fit. The symbol “A” added to threads, such as 2A, means external threads (screws), and “B” means internal (nuts). With the exception of 10/32 diameter. which is extremely popular, coarse thread comprises 90-95% of hex head cap screws and hex nuts sold in 18¬8 stainless, and perhaps 98% of other stainless items including machine screws and socket products. Coarse threads are deeper than fine threads with fewer threads per inch, so coarse threads may have greater protection against thread stripping, better tap in brittle materials, and better fatigue resistance. while fine threads may have better fit in thin-walled materials, higher torque strength, and increased tightness during vibration. A malleable and ductile metal which increases strength, hardness and corrosion resistance against salt water when added to brass alloys. A silvery gray metal with high corrosion resistance against salt waters, chlorides, and many acids. It is strong, though lightweight, and very expensive. Torque is the force used in twisting, such as tightening a fastener. Torsion strength is the amount of force needed to twist a fastener apart. Both measures consider the amount of pressure applied to the fastener and the length of the wrench used in the application. A fastener’s capacity to accept various impacts and shocks. To flip fasteners around like clothes in a dryer in order to clean fasteners and increase the shininess of stainless. Soap or a cleansing solution are often added. Indicates “unified” screw threads to “inch” dimensions used in the U.S. as distinguished from metric dimensions. A type of threads originating around the 1950’s with a more rounded fit in order to prevent cracks, reduce loosening due to vibration and slightly increase strength. Possessing a tighter fit, UNJ thread depth is smaller than the usual UN standards with the minor diameter of external threads on screws and internal threads on nuts both increasing. UNJ is used in critical applications by the aerospace and automotive industries. Where the shoulder of a fastener equals the pitch diameter or less, which means the shoulder is smaller than the outside diameter of the threads. It would indicate that a fastener was not extruded during its manufacture. A circular rim on the underside of the head of a bolt or on one side of a nut with the purpose of providing a flat bearing surface for the bolt or nut to sit on. A smooth washer face takes away any burrs or imperfections caused by the manufacturing process. An increased level of hardness caused by cold forming fasteners. Too much work hardening may cause a slight degree of magnetism in austenitic stainless. The resistance to a load pulling on the middle of a fastener until the fastener shows permanent deformation. The amount of pressure required to cause permanent deformity.